Home / Blog / What you can do on a Halong Bay day trip? 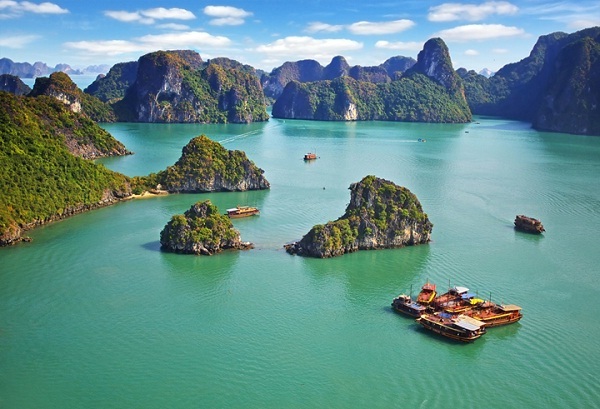 Halong Bay, one of new seven natural wonders, has been regarded as a superb spot for sightseeing. However, the bay is not just about spectacular limestone caves with stalactites strange in shape or water on which thousands of islands float. 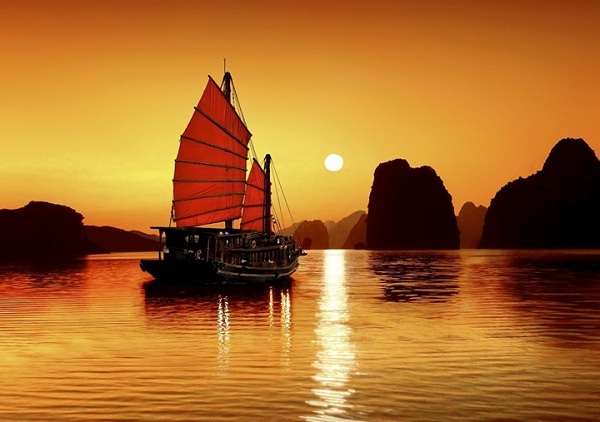 You can enjoy more than that on a Halong Bay trip, even the one for just one day, especially when you book your trip with tourism companies, say, Indochina Voyages. You may have a little bother spending such just one day on visiting Halong Bay because of its covering an enormous area. You may have no idea of what to do instead of just sailing around and around on water of the bay! One-day trip is particularly suitable for travellers having time limited but still desiring to explore Halong Bay. You just cannot watch the scene of floating islets on water. 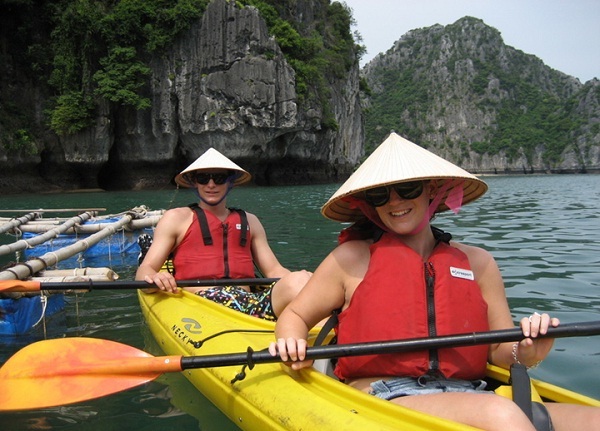 Kayaking is an exciting activity to get deeper insight into Halong Bay’s beauty. 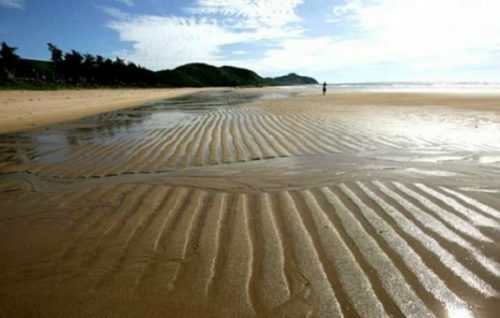 Naturally, the bay is composed of many ecological forms which do not always allow you to visit easily. Thus, that hardship will motivate you more to explore the bay whose allure derives from water caves hidden by rock walls. Unfortunately, these caves, are just accessible by kayak or small bamboo boats, so you should go kayaking on your own, which is definitely interesting than the latter, to reach them. The activity is usually included in cruise itinerary. Luon Cave is the most ideal spot to do this. 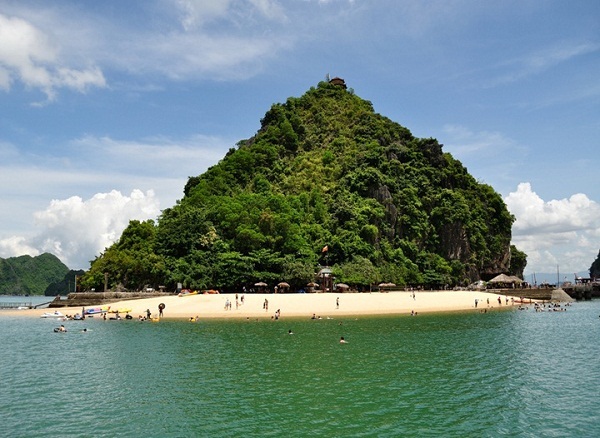 You must be wonder why you can swim at a beach, with white sand, right amid Halong Bay! Of course you can, because there is a fresh water beach called Titop on the island of the same name. It is not as large as beaches along the coast, but big enough for a number of people to swim in, to play water ball or riding water-motorbike. Swimming in the picturesque scene of Halong Bay is properly an unforgettable experience for any travellers which can hardly gain somewhere else in the world. 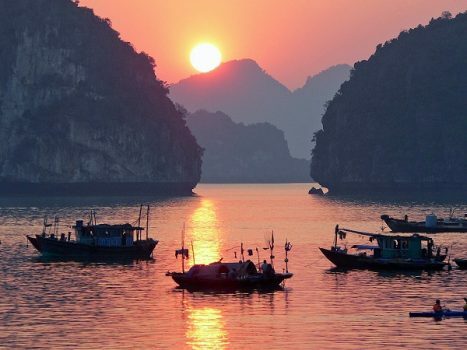 Sunset on Halong Bay is also worth seeing, especially when you have no chance to watch its magnificent sunrise. At that moment, the sun slowly disappears from the horizon, leaving the bay painted with orange-yellow glows, which is meant to impress you immediately. The scenery is all about sky and water blending with each other in colour, and highlighted by islets in dark green. You can watch the sun going down from a number of places, but here are several suggested: sundeck of your cruiser, the belvedere atop the hill on Titop island or cave mouths high above the water… After the time for watching sunset, you still have enough time to come back to the mainland, finishing your Halong Bay day trip in pleasure.